Boulevard 2000 in Barnet has a big screen. The pub shows football on TV, it has Sky Sports. Boulevard 2000 has terrestrial TV. New Southgate & Friern Barnet S Clu in Barnet has a dart board. The pub has DJ's, it has karaoke. New Southgate & Friern Barnet S Clu has live music events. The pub has a pool table, it shows football on TV. New Southgate & Friern Barnet S Clu has terrestrial TV. New Southgate Conservative Club in Enfield has a beer garden. The pub has an outside area, it has a dart board. New Southgate Conservative Club has DJ's. The pub has karaoke, it has live music events. New Southgate Conservative Club holds Poker Nights. The pub has a pool table, it holds quiz nights. New Southgate Conservative Club has a big screen. The pub shows football on TV, it has Sky Sports. New Southgate Conservative Club has terrestrial TV. Orange Tree in Barnet has a car park. The pub has a smoking area. 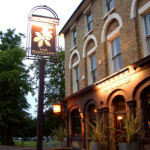 Bounds Green pub with seasonal pub food and brilliant beer selection. Quiz night Tuesday, brunch on Saturdays and traditional Sunday roasts. 020 8361 4238. The newly refurbished Springfield Bar & Grill opened on September 27th 2013. It's a great new local for everybody in the Bounds Green area, showing all major live sports action and with live music at weekends. It also has a fantastic food offering.